Romania is not a country that makes the news too often. It’s hidden on the Eastern outskirts of Europe, trying to catch up with its Western neighbors when it comes to democracy, economy and technology. But it is ignored by many, which is a pity – it has some of the best mineral waters of the continent, it has lands mostly untouched by industrial farming, and one of the cheapest and fastest internet services in the world, allowing its people to play mobile casino games, read the news, stream videos and communicate wherever they are. But there are several more reasons why the country is worth a visit, both during the summer and in wintertime. Romania is a melting pot of multiple civilizations. Its Western parts were mostly influenced by Austria, France and Italy, while its East bears signs of a Turkish, Slavonic and Balkanic influence. This mix results in an amalgam of traditions, spread across its multiple regions, which show in its time-honored attire, its foods, wines and wont. Romania has everything from an untouched mountain wilderness inhabited by bears, boars and wolves, to the largest rivel delta in the European Union. While its Black Sea shoreline is mostly covered in resorts and beaches, it has mountains barely even seen by the eye of man. And hidden among these mountains you can find small villages, tarns and caves, and picturesque places to relax. Don’t expect to find the undead, not even skeletons chained to the wall, in the dungeons of the Sighisoara (Schabburg) Castle. But it’s a place of great significance, as it is most likely the birthplace of the most famous Romanian ruler of them all, Vlad Tepes – also known as Dracula. Schabburg was for years the place of residence for Vlad II Dracul, father of the famous Impaler. The Sighisoara Citadel was built in the 12th century, and is inhabited even today. A UNESCO World Heritage sight since 1999. While Romania is a country with hardly any freeways, lacking the basic infrastructure at times, it is also known for being the country with the most beautiful highways ever (according to the guys from Top Gear). 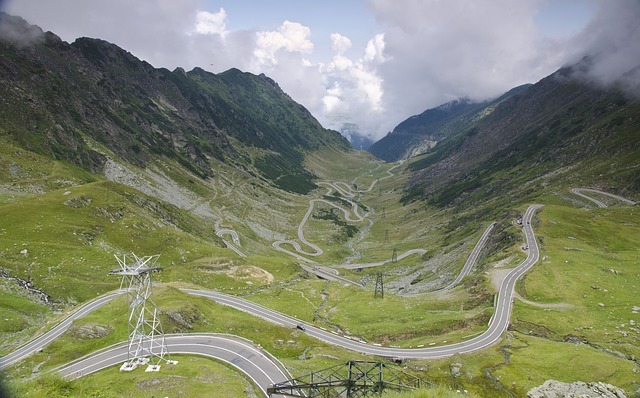 The Transfagarasan is a highway crossing over the Southern parts of the Carpathians, and the second highest road in the country, with an altitude of over 2 kilometers. Surrounded by an incredible, arid landscape, driving there is an out of this world experience. Back to the most famous Romanian brand, Dracula. The castle, built in the 13th century, represents the border between Transylvania and Wallachia. It was never actually the dwelling of the feared Impaler, but it has served as an inspiration to Bram Stoker to describe the vampire’s castle in his famous book. A landmark and a museum, the Bran Castle is open for tourists and visitors all year long. We hope this post and tips will help make your visit to the top tourist attractions in Romania a memorable one!